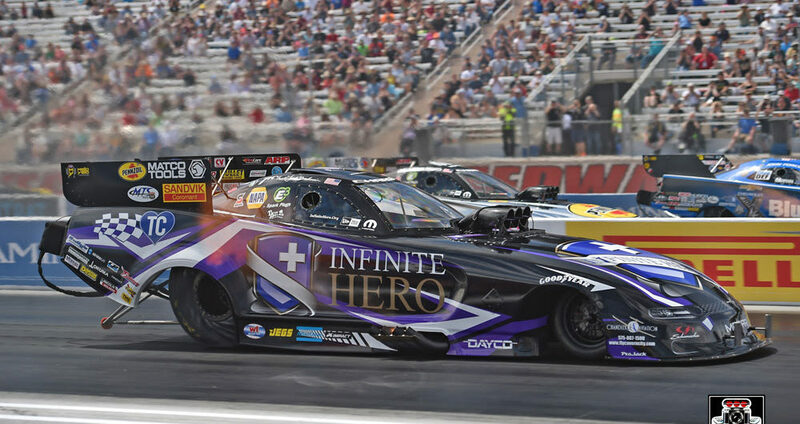 Jack Beckman raced the Infinite Hero Foundation Dodge Charger SRT Hellcat to his second final round appearance of 2019. After qualifying No. 11, the 2012 Funny Car world champion advanced into the second round with his lap of 3.958 seconds, besting Cruz Pedregon and Phil Burkart, Jr. In the second round, Beckman defeated John Force and Ron Capps and followed fellow DSR teammate Tommy Johnson Jr. into the final eliminations quad with his pass of 4.010 seconds. Beckman, who won his first-ever Funny Car Wally at The Strip in 2006, came up short in his bid for a second career victory in Las Vegas following winner J.R. Todd and Johnson to the stripe with his run of 4.370. Beckman ranks second in the Funny Car championship standings.